After the rapid growth and development in Social networking websites, lots of peoples are showing their interest in socializing their website with their favorite social networking website i.e. Facebook, Google Plus, Twitter and etc. The prompt progress in Social Media has made everyone think about its significance. This is the reasons why every now and then we are able to see stunning Widgets that relates Social Media. Tooltips is the latest addition in the Social networking Widgets. Whenever, your visitors would place their pointer on a social icon a small box will appear with information about the specific item that is being hovered. 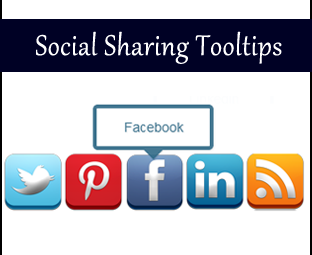 Today we will be integrating Tooltip Social Sharing Widget in BlogSpot Blog. Tooltip functionality adds more color and spice to this widget, because users can play while they are bookmarking your website on their personal best social website. The icons used in this widget are not ordinary one they are highly professional build with 3D frame work, so it will guaranty eye-catching look. It has total of 5 Social website along with RSS Feed that will allow you to maximize your Subscribers. This widget is entirely built with Pure CSS and HTML, so no compromise on the site speed and performance. The steps are extremely straightforward, and would merely take 5 minutes to complete the integration. Just follow the steps as mention below. Step#2: Now within the template search for ]]></b:skin> and just above it paste the following Style sheet CSS Code. Step#3: Once you have successfully pasted the Style sheet code go ahead and save the template by pressing save button. Replace https://plus.google.com/u/0/106374439082237286396 with your Google Plus URL. Replace fosterzone with your Pinterest User name. Replace Linkedin-URL with your Likdendin account URL. Replace http://feeds.feedburner.com/mybloggerlab with your blog's Feed URL. All Done: So that’s it save your widget and your Tooltip Social Widget is implemented on your blog. Hope you have enjoyed the roller-coaster ride. If you feel any difficulty while implementing this widget in your blog, then don’t hesitate to leave your comments. In coming days, we will be sharing more stunning widgets till then Peace, Blessings and Happy Socializing. Salaam bro Instead of linkedin how can I put youtube? Error parsing XML, line 1121, column 131: Element type "a" must be followed by either attribute specifications, ">" or "/>". Have you any idea? when to share on facebook and the link become auto shorten? The social sharing buttons are very helpful in promoting your site by having people share your post in other mediums. thanks for this wondorfull post,. But you have this social sharing script wich also can be used in wordpress??? I used this social widget on one of my fiverr buyer. Thanks a lot Syed! Love much from the Philippines. Qeustion: can I reduce the size that the icons are? they are quite big for my blog and I'd like them to be a bit smaller. If possible!! Question 2: how do I change the twitter and facebook to mine?